At the most basic level, AC power is the current that you get from your plug sockets at home, and DC power is used by batteries. Therefore, car batteries run on DC power, whereas most consumer electronics use AC power. As a result, if you want to use these devices on the go, then you'll need something called a 'car power inverter,' so that the DC current can be changed to AC, and thus be compatible with your electronics. 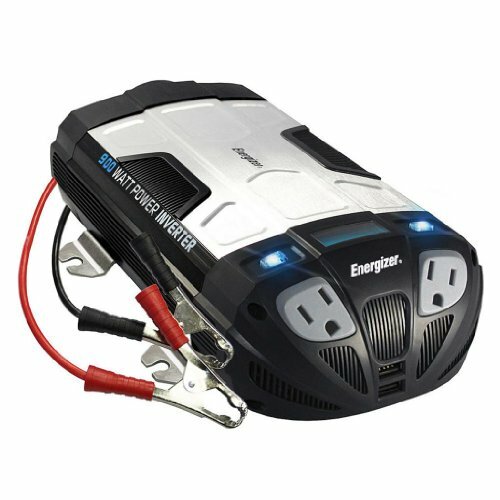 The Energizer EN500 is a top-tier car power converter that is designed for use out of the vehicle. With its 3-foot battery cables, it’s better suited to hooking up to a stationary vehicle at a camp ground, for example, as opposed to charging on the go. It is moderately pricey, although that’s well justified. 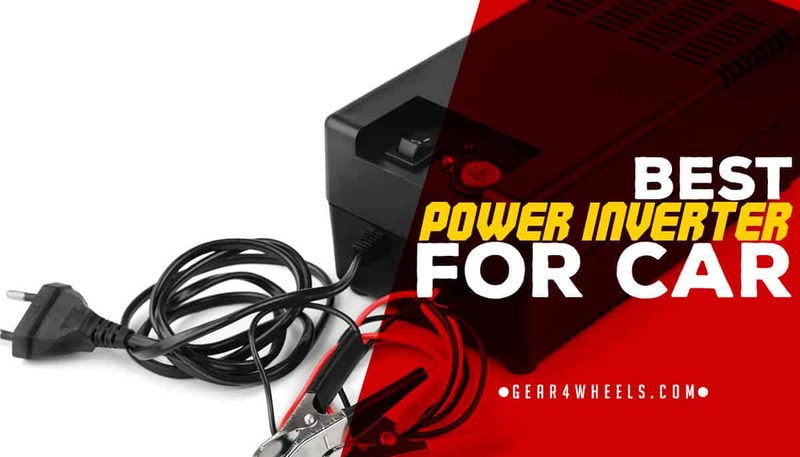 This power inverter from Energizer is an extremely heavy-duty unit that connects directly to a 12V DC battery to provide power to a wide range of electronics, including TVs, gaming consoles, power tools, smartphones and so on. Unlike cheaper models, it includes an LCD display. It's got 2 USB ports and 2 AC outlets, thermal cooling and thermal shutdown, and a range of other safety features. It’s easy to see where the price tag is justified. This power inverter features an LCD for displaying input and output power, as well as battery level, which is an incredibly useful information to have, save for running your car flat. The product comes with 3-foot battery cables and has AC sockets spaced well apart, meaning devices with larger plug sockets won’t get in each other’s way. The negatives aren’t a big deal in terms of value for money, but they’re worth being aware of. Firstly, this is the most expensive product we’ve reviewed, at around 4x the cost of some alternatives. There’s also no cigarette lighter connector, meaning you’ll have to use the included battery cables to hook this up; that is a more dangerous task than simply using an in-car outlet. 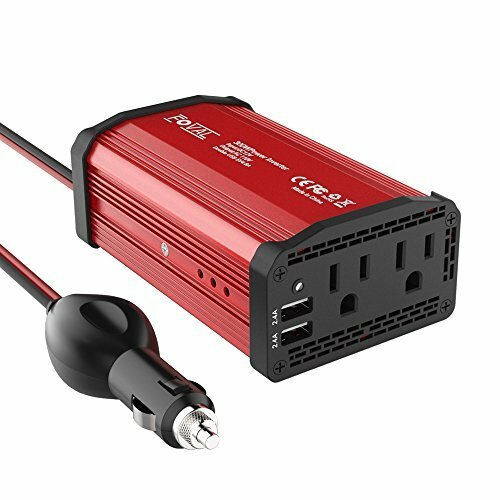 The CPI 200 CH is a power inverter designed to fit into the cup holder in your vehicle, converting your 12V cigarette plug into an AC outlet. It’ll charge a single AC and USB, enough for a driver or passenger to charge their electrical devices, though it has no extra space built in for other passenger items. With a cupholder-based design, this inverter can ride up front with you, giving you easy access to your charging ports. There’s a very basic design for controlling the power, too. Picking up one of these won’t break the bank, as it’s one of the cheapest in-car inverters we’ve looked at. With this unit, you only get a single type of each port, allowing one smartphone to be charged alongside one other household electrical device. What’s more, the power cord is very short, though this might not be such an issue when the product is placed in a cupholder in the front cabin. The warranty is unusually short, too. The BESTEK Advantage incorporates a lightweight, durable design, with fast charging for 2 USB devices and 2 AC-powered simultaneously. 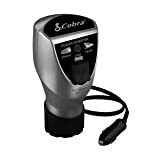 It has built-in multi-protection, with a 40-amp fuse protecting your devices against short circuits. An integrated cooling fan aids to reduce the build-up of heat that could lead to shortages. Overall, this inverter is no bigger than a leading brand smartphone, making it easy to tuck away within your vehicle. The unit also has some safety features, including built-in fuse protection, which helps to protect your devices in case of a short circuit. Finally, there’s an 18-month warranty included, which is non-limited, offering further peace of mind. Unlike some models like the Duracell power inverter that we’ve looked at (below), this product has a very industrial-looking design, which doesn’t blend well with the interior of most vehicles. The included cord also falls short compared to many alternatives. Finally, the USB plugs remain powered-on unless the unit is disconnected completely, which could lead to a drain on your car battery. The Duracell Pocket Inverter 175 is a premium brand product with a small footprint, available on the market since mid-2013. It’s a lot smaller than some other inverter units, though this can be beneficial from a logistical point of view. This Duracell 150-watt inverter allows the use of AC and USB-powered devices inside the car when connected to the DC outlet. It has a slim design with 2 front-mounted USB ports and 2 front-mounted AC outlets. There are built-in safety features, too, including short circuit and AC input overload protection, as well as DC input over/under voltage guarding. There is also built-in temperature protection. Due to its small size, this Duracell inverter is extremely lightweight. This means that it can easily be mounted in a variety of locations in smaller cars, where space is a concern. What’s more, the front-mounted sockets are easily accessible, making it even easier to position and mount the inverter. This unit is lacking a power switch, meaning that the only way to turn it off is to disconnect it entirely from the source. It is also expensive for its size; there are similar alternatives for less price. Finally, Duracell products, though well known, are not always the best performing and more durable products around. 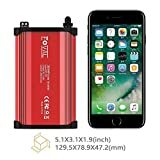 The Foval Power Inverter is a 300W DC 12V to 110V AC Converter that comes in at the budget-range of the market. It has enjoyed generally favorable feedback since its release in mid-2017. 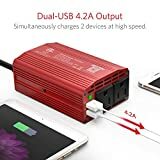 This is a premium 300-watt car power inverter that has 2 USB ports for charging smart devices, as well as 2 AC outlets for laptops and other home electronics, such as game consoles or DVD players. The unit has FCC authentication and is super-compact and lightweight. A durable metal casing provides increased durability and protection against bumps and bangs. This inverter contains a cooling fan to help prevent overheating, and indeed it doesn’t heat up excessively during operation. What’s more, it can support a wide range of devices for what is a very reasonable price tag. Laptops, smartphones, tablets and so on, can all be charged at once. The unit could do with being larger, as the outlets are so close together that bigger plugs struggle to fit alongside one another. It would also be useful to have a longer cord for the charger. Finally, the directions leave a lot to be desired; the translation is poor and difficult to understand. 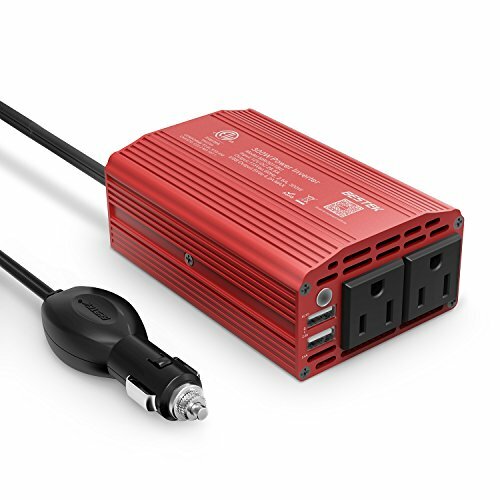 Despite it being the priciest option on the list, our choice out of these 5 popular in-car power inverters is the ENERGIZER EN500. With the Energizer brand, you know that you’re getting a trusted household name, as well as one that is bound to adhere to safety standards. Though it can’t be used for in-car charging, it’s the perfect solution when you need power at a campsite or while stationary.